China will fulfill its commitment made at the just-concluded Boao Forum for Asia to boost opening-up through powerful measures, President Xi Jinping said on Monday. 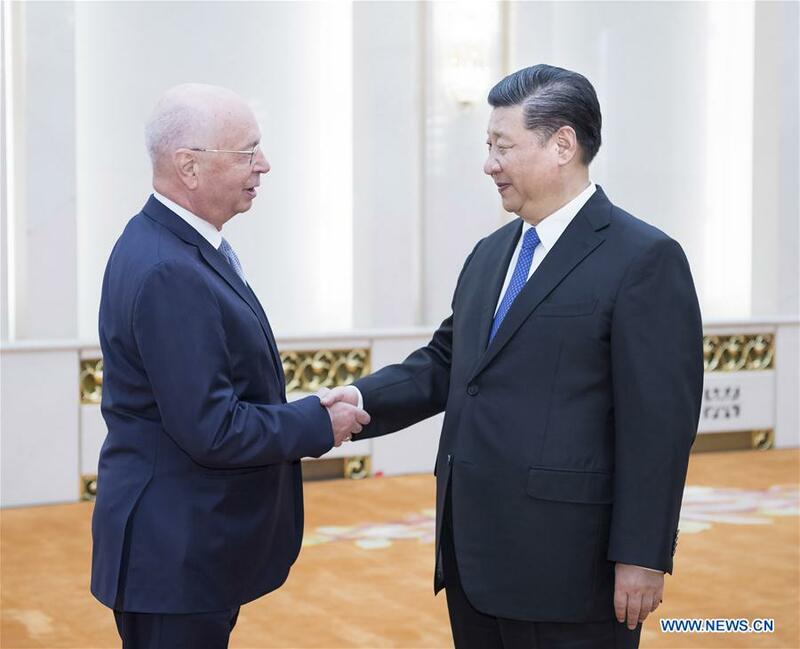 Xi made the remark while meeting with Klaus Schwab, founder and chief executive of the World Economic Forum, at the Great Hall of the People in Beijing. As a responsible major country, China will make joint efforts with the international community to enhance cooperation, boost opening-up and pursue win-win results to bring a bright, stable and prosperous future to the world, Xi said. Xi said there are some positive signs for the global economy, but the three fundamental contradictions he mentioned last year during the World Economic Forum meeting in Davos, Switzerland, still exist. They are the lack of a driving force for global economic growth, lagging global economic governance and unbalanced global development. Xi said that an anti-globalization and trade protectionism trend is rising and it has added risks and uncertainties to the global economy. Facing so many problems and challenges, the whole world should enhance coordination among equals and resort to multilateral cooperation, Xi said. History has repeatedly proved that only by openness and cooperation will the path become ever wider, Xi said, adding that major countries shoulder important and special responsibilities for those issues. Xi expressed gratitude for the arrangement that Schwab made for his speech at the Davos forum in January 2017. The World Economic Forum has upheld the spirit of innovation and exercised special influence over global affairs, Xi said, adding that China is expanding cooperation with the forum. Schwab said Xi's speech last January at Davos was impressive. "You cannot imagine how much it is referred to in discussions again and again among our members and participants," Schwab told Xi. Schwab said he was "particularly interested in" Xi's proposal of building a community of a shared future for mankind, which has been mentioned by Xi on many occasions, including at the Communist Party of China's 19th National Congress, the recent session of the National People's Congress and the just-concluded Boao annual conference. Schwab spoke highly of Xi's efforts to "keep our global system open and to keep it collaborative". The World Economic Forum supports economic globalization and multilateralism and it opposes trade protectionism and unilateralism, he said. Schwab said that he was proud of the cooperation between the forum and China in the past four decades, and he would like to enhance cooperation with China in such areas as advancing the building of the Belt and Road and boosting innovative development.